• Indicator Aluminium or Stainless Steel outer housing can be assembled to any length and mounted to suit the best viewing position. • Coloured Wafers 25mm wide, red and white (or green, red and yellow) remain magnetically locked in the vertical position until disturbed by the greater magnetic force of the float magnet. 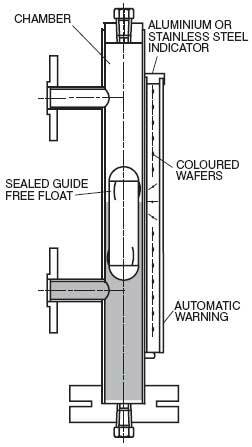 • Automatic Float Warning The wafers at the bottom of the indicator are mounted with their colours reversed. Should the float reach that level, they again present a sharp, immediately readable indication of float failure. • Sealed Float of reinforced stainless steel, titanium or corrosion resistant plastic. • Sealed Chamber fabricated from stainless steel tubing. •Interface The gauge is ideally suited for measuring liquid interfaces. Floats are available with a variety of specific gravities to suit the liquids being monitored. • Point Switches Switches can be fitted on the gauge at any level and so provide signals at high, low and intermediate points. •Transmission and Monitoring for Remote Display Can be offered as a complete original equipment package or retro-fitted to an existing Magnetic Gauge. •Versatility The simple concept of the Magnetic Gauge allows for flexible design to adapt to a variety of installation needs. Gauges can be manufactured to an almost unlimited length and in any configuration.